At first light and with the temperature at 10°C, I discover Seatao and Shadow in a pool in the wetland. 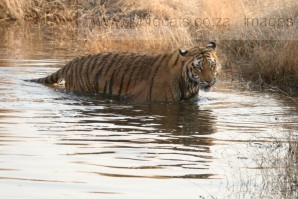 Why would tigers be swimming with the cold temperature, I wondered. As I approached closer, it became obvious. The two has a Cape Clawless Otter surrounded. The otter was not giving up easily. 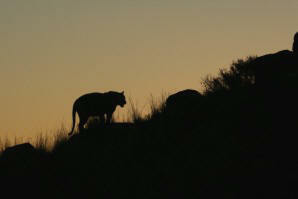 It lunged at the tigers when they approached too close. It barked at them and growled continuously. When the tigers attacked, it went under the water. The slippery otter evaded the slashing claws of the tiger time and time again. 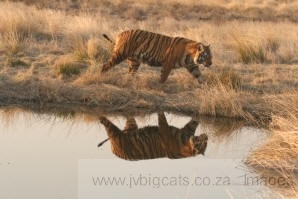 When the otter was out of sight, the tigers became unsettled, continuously growling at the water. Unfortunately, being a mammal, the otter had to come up for air whereupon it exposed its position. Finally, after an hour, the otter found a position against the bank of the river where tall reeds protected it. Here it thought it was safe. 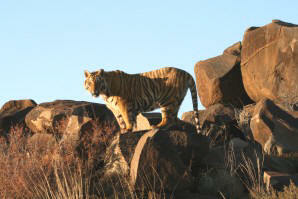 Now the tigers demonstrated intelligence and co-operation. Shadow kept the attention of the otter by swimming in front of it. Seatao left the pool and circled around on land, using the reeds as cover. Unknown to the otter, Seatao was less than 10 feet above it, poised on the bank to leap. With a huge leap, Seatao landed on top of the otter, momentarily stunning it. Quick as a flash, Shadow bit it through the back of the neck, the prize was theirs. For the next hour, they celebrated the hunt as they took it in turns to run with the otter through the water. Kids with a new toy. At one point, Shadow dropped the otter which sank. Once again, their intelligence and versatility amazed me. Using his feet, rather like a heron feeling for crabs and frogs, Seatao felt for the otter. Once located, he dunked his head in and came out with the kill. I have seen lion and leopard kill civets and genets and never eat them. 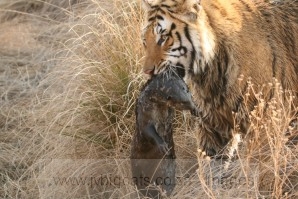 I have seen tigers kill mongooses and not eat them. I was determined to see whether the tigers would eat the otter, but unfortunately I had to leave the scene to release some blesbuck. When I returned later, tigers and otters were gone. In summary, the hunt showed intelligence, patience, adaptability and co-operation, all ingredients for successful predators. I don't believe lion or even leopard would have made this kill. 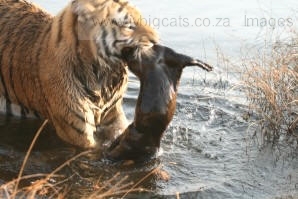 The unfortunate otter encountered a cat which is very much at home in the water. Only the jaguar of the big cats, is reputed to use the water to hunt the way tigers will. It adds another dimension to the tiger, it gives it another string to its bow as a super predator.